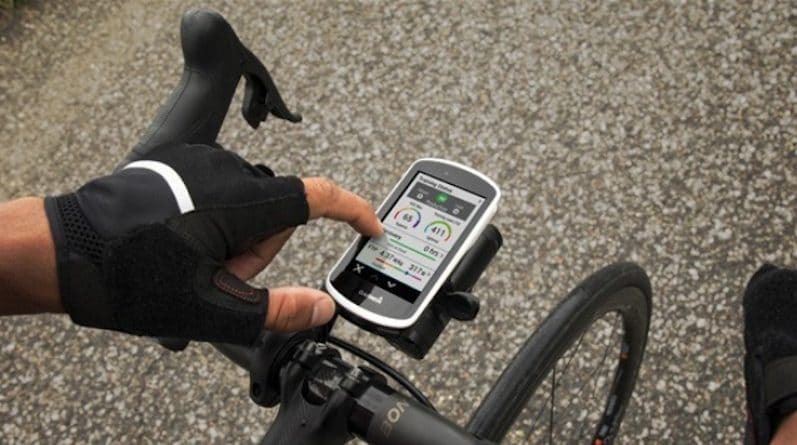 Image source: GarminFirst leaks are starting to emerge on Garmin’s upcoming Edge 1030 cycling computer. Launched more than three years ago, its predecessor is still one of the best cycling GPS units around today. Edge 1000 features a high-resolution 3 inch colour screen, giving great visibility. The cycling computer provides advanced analysis features including time in zone, cycling-specific VO2 max and recovery time (when used with a power meter and heart rate monitor), indoor trainer support and cycling dynamics (when used with compatible power meter). Edge 1000 also comes preloaded with maps and includes turn-by-turn navigation and new navigation alerts. In-ride challenges through Strava and Garmin Connect segments are there to keep you motivated. Images taken from the cyclerepublic.com website provide some first details and technical specs of the upcoming 1030 device. The pictures seem to have been accidentally posted by the online retailer and were quickly removed. Here is what we know so far about the new device. It seems the main difference between the new and current device will be the screen size. The 1030 sports a 3.5 inch screen rather than the 3 inches of the 1000. To accommodate the larger display real-estate, the bezel are closer to the edges. There are two buttons at the base of the unit which can be used to operate the device. Other info highlighted on the website includes Popularity-derived Routing, Rider-to-rider Messaging and Improved Cycling Awareness features. The first displays best on and off routes travelled by Garmin cyclists which will probably prove to be a popular feature. Rider-to-rider messaging lets you send pre-written notes to other riders’ Edge devices. Improved Cycling Awareness features have to do with connectivity. You can, for example, respond to phone calls or texts with prewritten messages and keep your loved ones aware of your location in real time with LiveTrack and GroupTrack2. Edge 1030 will come with 16 hour battery life, slightly up on the 15 hours provided by the 1000. If that’s not enough, you can add up to 24 hours more with the optional extended battery pack. Other info leaked from the same website points to a Vector 3 pedal-based power meter that will be launched alongside the new cycling computer. It features a new design which moves away from the pod we have seen on the predecessor versions. It also comes with upgraded cycling dynamics. If the rumours turn out to be true, it should’t be long before Garmin’s new cycling accessories hit the shops.